Remove the tube and the cathode resistor. Short the grid connection to the cathode connection at the tube socket. Voilà! I didn't know anything about valve tubes before watching this video. One question that poped up in my mind : could the "quality" of the 6V supply affect the quality of the sound by modifying the power of heating element (and thus the electron flow) ? One question that pops up in my mind : could the "quality" of the 6V supply affect the quality of the sound by modifying the power of heating element (and thus the electron flow) ? In some primitive (or high-power) tubes, the heater is also the cathode. But for almost all tubes used for audio, the cathode is a metal tube/oval with the heater filament wires INSIDE for indirect heating. So the actual current through the heater isn't really "in the circuit". Most tube heaters were operated directly from mains-frequency (50/60Hz) AC power. The thermal mass of the heater completely swamps out any effect from the sine-wave power of the heater current waveform. In exactly the same way that nobody can actually perceive "flicker" from an incandescent lamp operating at mains frequency. Of course if circuit design or execution is sloppy, (or component failure) it is possible for the heater AC "hum" to get into the signal path. But that is an exceptional condition and not commonly found in properly designed circuits. "Golden ears" audiophools imagine they can "hear" the difference between AC and DC power in an indirectly-heated filament tube. But they imagine lots of other things also, so that comes as no particular surprise. 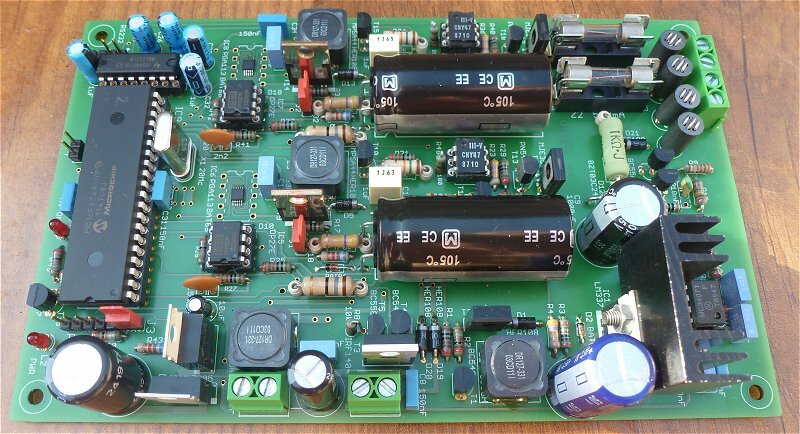 People building high-gain (high distortion) guitar amplifiers have reported that power the heater of the first tube with DC can cut down on hum that is otherwise inductively coupled through the heater wiring. It shouldn't do much in linear amplifiers. Apparently noisy DC on heaters can result in signal noise as well, surprisingly enough. Obviously not valves with a top hat anode connection at 750 Volts then. No. I also do not particularly like the higher voltages, you know, when the wires have to be a certain distance apart or they would arc over. I have seen insulated top connectors, those would reduce the chance of getting zapped. Depending on the tube and the circuit design, in some cases a small current can flow between the cathode and heater, introducing hum. Of course this is only noticeable in something like a phono preamp where the input signal is a couple of mV. After all, pretty much all tubes were used with AC powered heater. Only battery operated devices had DC heaters (and most tubes designed for battery operation were directly heated) back in the day when tubes were common. It was common for small 6.3V transformers to be called "filament transformers". Guess why. Younger players may rarely if ever come across that term. The usual heater construction is a folded wire inserted inside the cathode sleeve. In tubes specifically designed for low level audio preamp applications, a twisted/coiled heater wire was used to help cancel out the electromagnetic field that could couple into the cathode circuit and result in hum. An example is the 7025, which is a 12AX7 with a coiled heater, specifically designed for audio applications. Another trick was to use the input stage heaters as cathode resistors for the push-pull output stage. In this way, they were operated on DC current, without the expense of additional transformer windings/rectifiers/filter caps. A grid is a physical thing, conductive circular mesh surface placed between the cathode and anode of a tube. Grid drive is a voltage (AC + any required DC bias value) that will effect/control the current conduction between the anode and cathode terminals. Let me rephrase: Grid Voltage and Grid Drive Voltage. It's specific to the tube tester. The grid is positive wrt the cathode!? It's running in enhancement mode (to borrow a mosfet term). The data sheet gives data for depletion mode. I suppose that's a consequence of running the plate voltage so low. It's not a mode that's characterized on the data sheet. What do the curves look like for this mode? A spice model probably couldn't be trusted to give the correct result for this region of operation. What's the difference in meaning of "Grid" and "Grid Drive" in the voltmeter section? Is this the voltage across a grid current sense resistor? A modern tube tester. Cool! Could be a sense voltage yes. Grid drive is overdriving a valve by pushing it to grid current leaking territory with near zero and above zero voltage swing, but there is also capacitor blocking possibility when AC coupled. i.e. to peg on big transients until discharged. Nasty distortion effect. It takes a DC coupled buffer driver stage either valve or Mosfet to really push it. Especially for power tubes where it makes sense. In this one its just a starved tube drive necessity to go down there because of little anode voltage available. The guys who made this headphone gadget amp wanted to have tubes for show off or to just spice it up too, but it looks they knew how to work with valves even in weird modes nonetheless. Personally I prefer exact sound reproduction, not distorted, hence I use high end DAC coupled with monitor grade IEM. What do you consider exact sound reproduction? IMHO, there's absolutely nothing like the live sound of instruments (that are NOT electronically amplified in any way). How could a speaker, of which the membrane that must reproduce the sound is of a different shape than any instrument, ever come close to reproducing the sound faithfully? Oh, it does a good job at trying, but it doesn't come close to the real thing. I have a good hifi system that even audiophiles wouldn't frown upon, and I am satisfied with it, but there's nothing like a live acoustic instrument. Perhaps that's one of the reasons why I recently took up learning to play the guitar (but it's also got something to do with doing it yourself). One: the output stage has one amplifier driving another unity buffer, then paralleling the outputs. Does this not introduce distortion or other issues due to the propagation delay of the NE5532? I know it has a global feedback, but seems like it would still have issues. A better solution would seem to parallel both amplifiers? Maybe I'm wrong - not an expert on audio buffers, but want to become one. Two: I have read numerous times never to use SMT ceramic capacitors in audio paths since they 'microphone' and distort the signal. Is this the case or no? Bonus rant... I HATE HATE HATE blue LEDs under tubes. Looks lame and doesn't let the pretty 'natural' glow out. If anything put an amber one in. Blah! 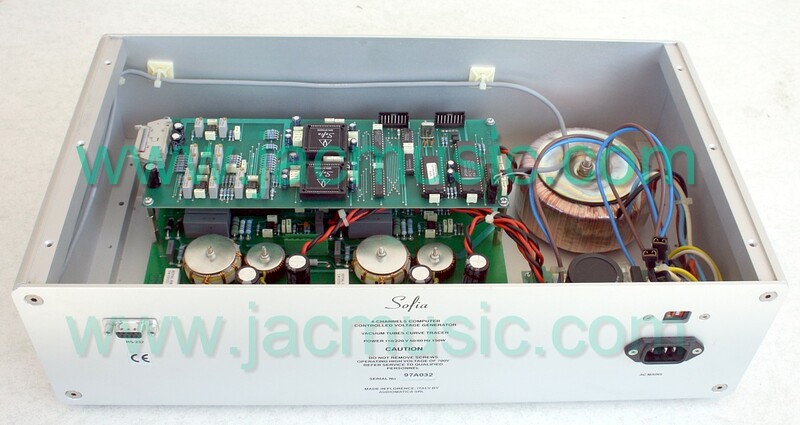 In high quality audio gear, ceramic caps (not just SMT ones) are generally frowned upon as coupling capacitors because they exhibit a change in capacitance with applied voltage due to the piezoelectric effect. Some are worse than others, however. It depends. Class 1 (NPO, C0G, U2J,etc.) are pretty good. Class 2 (X7R, Y5R, Z5U, etc.) can be pretty bad especially higher values in smaller packages. If the signal has frequencies for which the capacitive reactance is much smaller than the impedance of the rest of the circuit, it's not too bad. This would be the case for interstage coupling. Otherwise the lower frequencies cause intermodulation distortion. This would be likely be the case for filters and equalizers. I've heard that is you hook up the filament backward the audiophiles can hear Paul McCartney whispering to them. One: the output stage has one amplifier driving another unity buffer, then paralleling the outputs. Does this not introduce distortion or other issues due to the propagation delay of the NE5532? Probably insignificant for audio frequencies. Anyway, the bias of the tube (12V anode-cathode voltage, 2.5 mA cathode current) is so atrocious that the distortion of that "buffer" will dominate everything (which is of course by design). It's not unlike operating a BJT in it's saturation area which is ridiculous for a linear amplifier. Tubes have a reputation of having high distortion which is not true if the circuit is designed properly. For those direct heated (filament is cathode) tubes, if not designed properly, you will hear hum. DC filament has better tolerance to improper design regarding to hum. No true "audiophile" would buy a 50 dollar headphone amp, so this is not "audiophile quality". I'll bet literal bottom dollar that they are Y5V. Maybe X5R, but larger than 0.1uF C0G are virtually non-existent and very expensive (have used a 0.1uF C0G before). This will all be moot soon. Apple is dropping the 3.5mm analog output jack completely. If you don't want to use wireless (Bluetooth) headphones, there will be digital headphones that plug into the Lightning connector. No word on how you will plug in BOTH you headphones AND your charger, sync cable, etc. Not letting the audio loose in the analog domain means they can enforce DRM right to your eardrums. Wow is that for real? So in the near future the Apple user can't pipe his/her music to a typical analog audio amp/speaker system via a analog jack unless it's an approved and compatible amplifier? Don't own anything Apple, so no problem here. Wow is that for real? Bent CEO makes bent phones -- there is nothing wrong there. Legal disclaimer: this post is only intended to entertain people with its pun, the author does not express any discrimination against BLGT. Who are you kidding, everyone knows Paul's dead, they told us that many many moons ago. Or maybe his ghost lives amongst the vacuum in the valves. This is always a cute trick. I have a Fisher TA-600 that uses this system. One of the phono tubes developed a heater-cathode short, and that particular cathode was grounded. It did some unhappy things to the bias on the output stage. There are certainly some interesting bits of economy used on electronics at times. One of the oddest I've seen on a tube amp was the original bias supply in my big Bogen PA amps. It used a 0.47 uf cap off the 300 VAC winding to feed through a diode to get the negative DC supply. That now has a small 6vac transformer fed backwards to run the bias supply. Tube amps have long been a contentious thing in the electronics world. Audio guys tell you they sound better. Measurement devices tell you they are shite on a stick. Personally I say they are both true. Tube amps measure badly but are pleasing to listen to. Its the difference between steam power and internal combustion engines. By every measurable way the IC engine wins, but we still like steam trains.